For the past few months, Captain Marvel has been compared to Dragon Ball. Now that the film is out, those comparisons keep on coming. Since the trailers hit, there have not only been comparisons between Captain Marvel and Goku, but also between the Skrulls and the Piccolo in the live-action adaptation Dragon Ball Evolution. But the Skrulls look even more like the Namekians in the Dragon Ball Z anime than in the Hollywood adaptation. The comparison can be spun out to include Thanos, too. The MCU has finally hit Dragonball Z levels of power creep and I love it. Captain Marvel is basically Goku and she can go super sayain. Thanos is about to get bodied by both of the sayai- I mean Captains. For those who have seen and enjoyed Captain Marvel, the movie seems to show that a live-action Dragon Ball is possible, with calls for Marvel Studios to make it. Actually, that makes sense. Marvel Studios has proven it can take comic source material and turn it into successful cinema. However, doing a live-action version of a manga presents an array of challenges, both cultural and stylistic that open the film and its filmmakers up to criticism that might not exist for Marvel’s own comic adaptations. I just saw live action DragonBall Z, I mean, Captain Marvel. 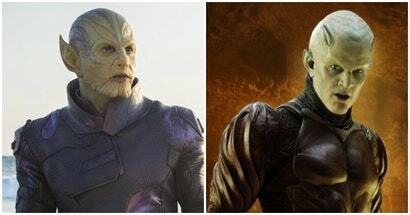 Captain Marvel: Hey can I copy your homework? DragonBall Evolution: Yeah just change it up a bit so it doesn't look obvious you copied. Why I am not happy with how the Skrulls were treated in the movie, this is pretty good. Hmm lets see. Skrulls first appeared in 1962 and while the current appearance is a little more toned down it's still basically the same. DBZ started in what 1988? So who is copying who? And when you get down to it, they both look a bit like modified orcs or elves so they're both copying way older archetypes.